Archaea usually have a single circular chromosome. Archaea are genetically distinct from bacteria and eukaryotes, with up to 15% of the proteins encoded by any one archaeal genome being unique to the domain, although most of these unique genes have no known function. DNA replication in archaea requires a specific primase that shares similarities to the RNA recognition motif (RRM) and to viral RNA dependent RNA polymerases. The circular chromosomes of archaea contain multiple origins of replication for initiation of DNA synthesis. eukaryote: Any of the single-celled or multicellular organisms, of the taxonomic domain Eukaryota, whose cells contain at least one distinct nucleus. bacteria: A type, species, or strain of bacterium. Archaea usually have a single circular chromosome, the size of which may be as great as 5,751,492 base pairs in Methanosarcina acetivorans, which boasts the largest known archaean genome. One-tenth of this size is the tiny 490,885 base-pair genome of Nanoarchaeum equitans, which possesses the smallest archaean genome known; it is estimated to contain only 537 protein-encoding genes. Smaller independent pieces of DNA, called plasmids, are also found in archaea. Plasmids may be transferred between cells by physical contact, in a process that may be similar to bacterial conjugation. The means of asexual reproduction that are used by Archaea include binary reproduction, multiple fission, fragmentation, or budding. The cell division process is controlled by the cell cycle; the chromosomes within the Archaea are replicated to produce two daughter chromosomes. Archaea typically have a single circular chromosome. The two daughter chromosomes are then separated and the cell divides. This process in Archaea appears to be similar to both bacterial and eukaryotic systems. The circular chromosomes contain multiple origins of replication, using DNA polymerases that resemble eukaryotic enzymes. However, the proteins involved that direct cell division are similar to those of bacterial systems. DNA replication, similar in all systems, involves initiation, elongation, and termination. The replication of DNA, beginning at the origins of replication present on the circular chromosomes, requires initiator proteins. The recruitment of additional proteins by way of the initiator proteins allows the separation of the circular DNA and results in the formation of a bubble. The DNA replication system in Archaea, similar to all systems, requires a free 3’OH group before synthesis is initiated. The primase used to synthesize a short RNA primer from the free 3’OH group varies in Archaea when compared to that of bacterial and eukaryotic systems. The primase used by archaea is a highly derived version of the RNA recognition motif (RRM). It is structurally similar to viral RNA dependent RNA polymerases, reverse transcriptases, cyclic nucleotide generating cyclases, and DNA polymerases involved in DNA replication and repair. Once the RNA primase has performed its job, DNA synthesis continues in a similar fashion by which the eukaryotic system and the DNA is replicated. Most of the metabolic pathways, which comprise the majority of an organism’s genes, are common between Archaea and Bacteria. Within prokaryotes, archaeal cell structure is most similar to that of Gram-positive bacteria, largely because both have a single lipid bilayer and usually contain a thick sacculus of varying chemical composition. It has been proposed that the Archaea evolved from Gram-positive bacteria in response to antibiotic selection pressure. The evolution of Archaea in response to antibiotic selection, or any other competitive selective pressure, could also explain their adaptation to extreme environments (such as high temperature or acidity). prokaryotes: ( /proʊkæri.oʊts/, pro-kah-ree-otes or /proʊkæriəts/, pro-kah-ree-əts) a group of organisms whose cells lack a cell nucleus (karyon), or any other membrane-bound organelles. Most prokaryotes are unicellular organisms, although a few such as myxobacteria have multicellular stages in their life cycles. archaea: a taxonomic domain of single-celled organisms lacking nuclei that are fundamentally from bacteria. bacteria: Bacteria constitute a large domain of prokaryotic microorganisms. Typically a few micrometres in length, bacteria have a wide range of shapes, ranging from spheres to rods and spirals. Bacteria were among the first life forms to appear on Earth, and are present in most habitats on the planet. The relationship between the three domains is of central importance for understanding the origin of life. Most of the metabolic pathways, which comprise the majority of an organism ‘s genes, are common between Archaea and Bacteria, while most genes involved in genome expression are common between Archaea and Eukarya. Within prokaryotes, archaeal cell structure is most similar to that of Gram-positive bacteria, largely because both have a single lipid bilayer and usually contain a thick sacculus of varying chemical composition. In phylogenetic trees based upon different gene/ protein sequences of prokaryotic homologs, the archaeal homologs are more closely related to those of Gram-positive bacteria. Archaea and Gram-positive bacteria also share conserved indels in a number of important proteins, such as Hsp70 and glutamine synthetase I.
R.S. Gupta has proposed that the Archaea evolved from Gram-positive bacteria in response to antibiotic selection pressure. This is suggested by the observation that archaea are resistant to a wide variety of antibiotics that are primarily produced by Gram-positive bacteria, and that these antibiotics primarily act on the genes that distinguish Archaea from Bacteria. His proposal is that the selective pressure towards resistance generated by the Gram-positive antibiotics was eventually sufficient to cause extensive changes in many of the antibiotics’ target genes, and that these strains represented the common ancestors of present-day Archaea. The evolution of Archaea in response to antibiotic selection, or any other competitive selective pressure, could also explain their adaptation to extreme environments (such as high temperature or acidity) as the result of a search for unoccupied niches to escape from antibiotic-producing organisms; Cavalier-Smith has made a similar suggestion. Gupta’s proposal is also supported by other work investigating protein structural relationships and studies that suggest that Gram-positive bacteria may constitute the earliest branching lineages within the prokaryotes. Archaea possess genes and several metabolic pathways that are more closely related to those of eukaryotes than prokaryotes. Archaea exhibit a great variety of chemical reactions in their metabolism and use many sources of energy. The energy released generates adenosine triphosphate (ATP) through chemiosmosis, in the same basic process that happens in the mitochondrion of eukaryotic cells. The chromosomes replicate from multiple starting-points (origins of replication) using DNA polymerases that resemble the equivalent eukaryotic enzymes. metabolism: The complete set of chemical reactions that occur in living cells. 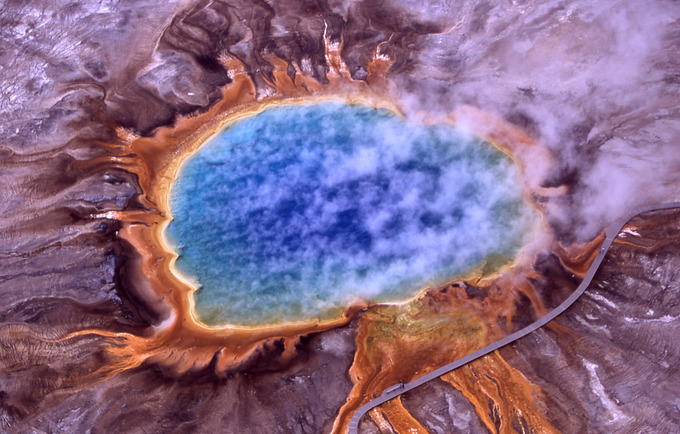 The evolutionary relationship between archaea and eukaryotes remains unclear. Aside from the similarities in cell structure and function that are discussed below, many genetic trees group the two. Archaea and other domains: Phylogenetic tree showing the relationship between the Archaea and other domains of life. 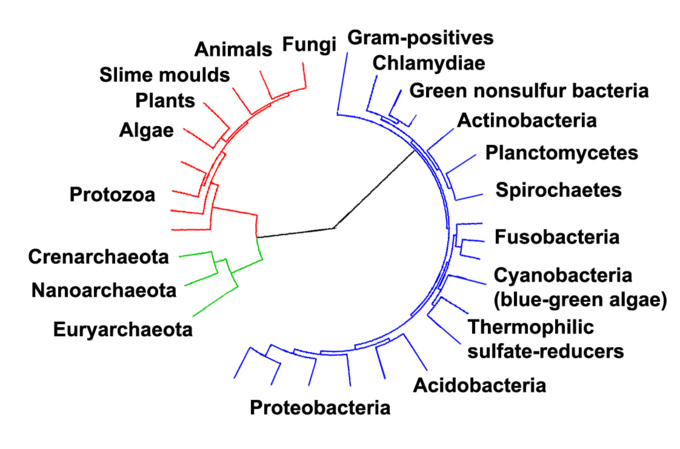 Eukaryotes are colored red, archaea green and bacteria blue. Complicating factors include claims that the relationship between eukaryotes and the archaeal phylum Crenarchaeota is closer than the relationship between the Euryarchaeota and the phylum Crenarchaeota, and the presence of archaean-like genes in certain bacteria, such as Thermotoga maritima, from horizontal gene transfer. The leading hypothesis is that the ancestor of the eukaryotes diverged early from the Archaea, and that eukaryotes arose through fusion of an archaean and eubacterium, which became the nucleus and cytoplasm. This explains various genetic similarities but runs into difficulties when it comes to explaining cell structure. Despite this visual similarity to bacteria, archaea possess genes and several metabolic pathways that are more closely-related to those of eukaryotes, notably the enzymes involved in transcription and translation. Archaea exhibit a great variety of chemical reactions in their metabolism and use many sources of energy. These reactions are classified into nutritional groups, depending on energy and carbon sources. Some archaea obtain energy from inorganic compounds such as sulfur or ammonia (they are lithotrophs). These include nitrifiers, methanogens and anaerobic methane oxidisers. In these reactions, one compound passes electrons to another (in a redox reaction), releasing energy to fuel the cell’s activities. One compound acts as an electron donor and another as an electron acceptor. The energy released generates adenosine triphosphate (ATP) through chemiosmosis, in the same basic process that happens in the mitochondrion of eukaryotic cells. The chromosomes replicate from multiple starting-points (origins of replication) using DNA polymerases that resemble the equivalent eukaryotic enzymes. However, the proteins that direct cell division, such as the protein FtsZ, which forms a contracting ring around the cell, and the components of the septum that is constructed across the center of the cell, are similar to their bacterial equivalents.